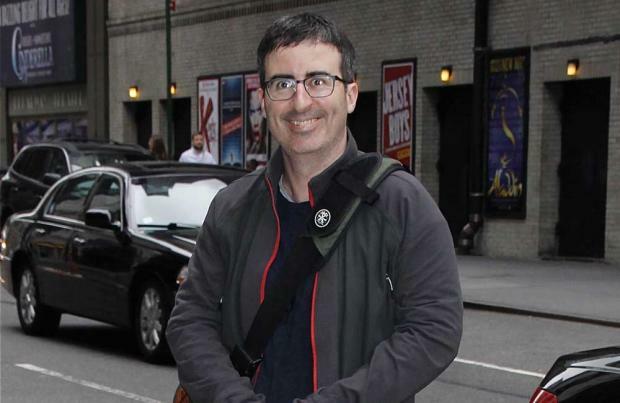 John Oliver will provide the voice of Zazu in the live-action remake of 'The Lion King'. Disney are rebooting the beloved 1994 animated movie with 'Jungle Book' filmmaker Jon Favreau helming the project and now it has been revealed that Oliver, 40, will join the cast, which includes Donald Glover as Simba and James Earl Jones, who will be reprising his role as Mufasa. Recently it was revealed that Seth Rogen and Billy Eichner were cast to play the comedy duo Timon and Pumbaa. The Wrap confirmed that the 'Last Week Tonight' host will bring to life the high-strung hornbill, who serves as Mufasa's loyal chief steward. Oliver will be stepping into the shoes of 'Mr Bean' star Rowan Atkinson, who provided the original voice of the hornbill in the animated classic, which is one of the highest-grossing animated films of all time. The movie is set for a July 2019 release and Favreau is already in pre-production, with Jeff Nathanson writing the script. It has also been rumoured that Beyonce is the preferred choice to play Nala in the movie. As well as keeping Sir Elton John and Tim Rice's original songs, which include 'Can You Feel The Love Tonight', 'Be Prepared' and 'I Just Can't Wait To Be King', the remake will also feature some new tunes. 'Can You Feel the Love Tonight' played out over the credits and went on to win Best Original Song at the 1995 Academy Awards. Disney has released a string of remakes as of late including 'Maleficent', 'Cinderella' and 'Beauty and the Beast'. Back in February, Disney revealed the movie is on the "fast-track to production" and the studio announced other remakes including 'Dumbo', 'Aladdin' and 'Mulan'.